Was it a PR stunt, a misguided judgement or a major oversight that saw Louis Vuitton's ‘The Soul Of Travel’ exhibition shut down before it had even opened its decadent doors in Russia's Red Square? 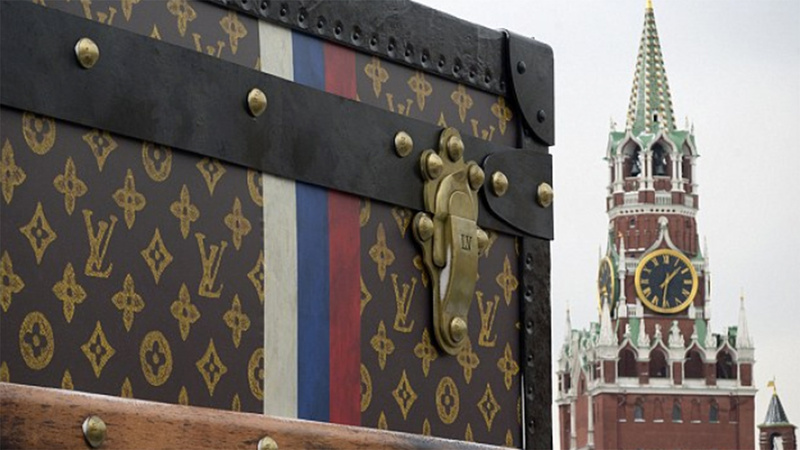 The luxury brand, best known for its monogrammed exclusive luggage, was all set to host a branded exhibition celebrating the brand and its rich history and legacy in Russia. 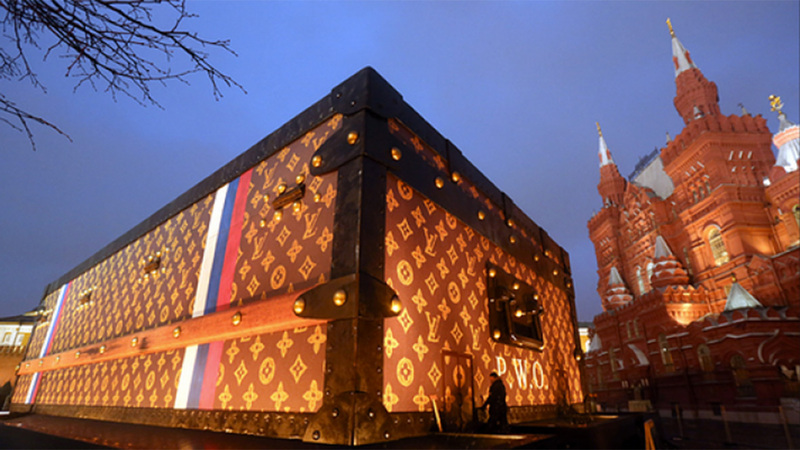 The exhibition to be held in Russia’s Red Square aimed to celebrate the brand’s rich legacy with Russia and would be housed in a giant replica Louis Vuitton suitcase, measuring 102 feet long and 30 feet high. The giant case was a replica of luggage created for Prince Wladimir Orloff at the beginning of the 20th century and even featured his monogrammed initials. The case was to host an exhibition of 30 iconic Louis Vuitton suitcases associated with the likes of Greta Garbo, Catherine Denevue and other global and Russian luminaries. “This exhibition showcases some extremely rare pieces from Louis Vuitton’s heritage collections, some of which have never been shown before. As a tribute to the longstanding relationship with Russia, historical pieces belonging to the Romanov family and great Russian artists are displayed to the public,” Vuitton said in a statement. The exhibition is scheduled to run through December and January plans to donate all proceeds from the exhibition to a childrens charity. The exhibition site, just steps from the mausoleum where the remains of Vladimir Lenin lie, has ignited a huge amount of controversy with calls to move the location. 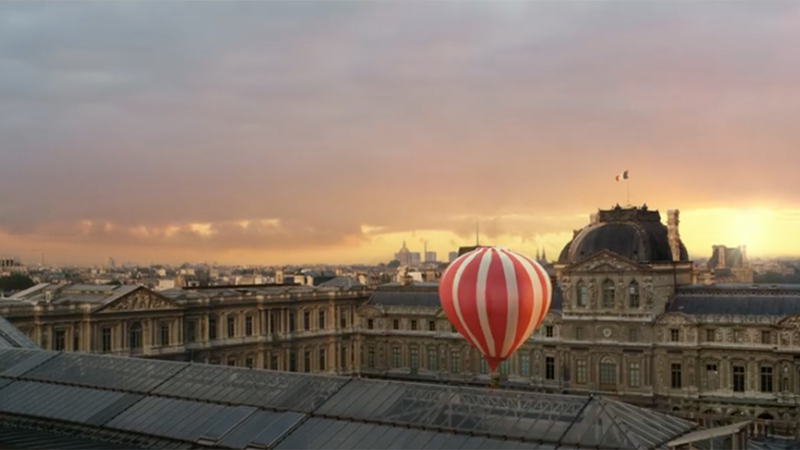 The exhibition is part of the latest marketing push from Louis Vuitton “L’Invitation au Voyage” which is revealing the soul and passion of travel through a series of short online films and ads featuring model Arizona Muse and a hot air balloon. The films have centered on Paris and Venice (so far) and celebrate the rich, decadent, opulent, romantic and mysterious elements of travel, they ooze class, style and luxury. Did Louis Vuitton intentionally kick the hornets nest by erecting a “shrine to bourgeois excess” alongside the remains of the “mastermind” of the Bolshevik revolution and creator of communist Soviet Union? Igniting a debate about Russia’s history in a bid to gain attention and visitors to an exhibition was clearly the aim of this exhibition, but did Louis Vuitton intend to cause such controversy? It’s hard to know just how much thought the fashion set put into the location. Louis Vuitton has done huge luggage before but usually it has been wrapping its own stores. Taking a two storey piece of luggage to the streets probably seemed a great idea, setting it up next to the remains of Lenin, not so much. So marketing genius or epic mess up? Louis Vuitton is clearly targeting Russia’s emerging fashion set who are not only dripping in wealth but actually have an excellent sense of style and a an eye for fashion. The stereotype of “spoilt couture-loving” Russians has been well known by fashion house’s for years, however in recent years this image has been overtaken by a more stylish and fashionable crowd. Miraslava Duma, fashion journalist and founder of Buro 24/7, designer Vika Gazinskaya, couture designer Ulyana Sergeenko and fashionista Elena Perminova, (who is the wife of Russian billionaire Alexander Lebedev) have lead a style revolution for Russia and have put the eye-wateringly wealthy and designer-garb loving elite of Russia on every fashion house’s radar. Accordingly this year the fashion industry has celebrated the return of Russian style, Moscow’s fashion week was bigger than ever and fashion houses have been racing to get a foothold in the lucrative market. Against this backdrop Louis Vuitton’s attempts to hold an exhibition celebrating the brand’s deep ties with the nation make a lot of sense and it’s easy to see that in their haste to embrace the market they clumsily stumbled into a very sensitive political issue. However, this to me just seems a little too naive and I can’t help but think they deliberately intended to set up alongside one of the fathers of communism allowing wealthy Russians to draw the comparisons themselves. The exhibition in many ways can be viewed as a celebration of capitalism and its presence in the centre of Russia is a sign of Russia’s alignment with the west – which is the very point that is upsetting many Russians. 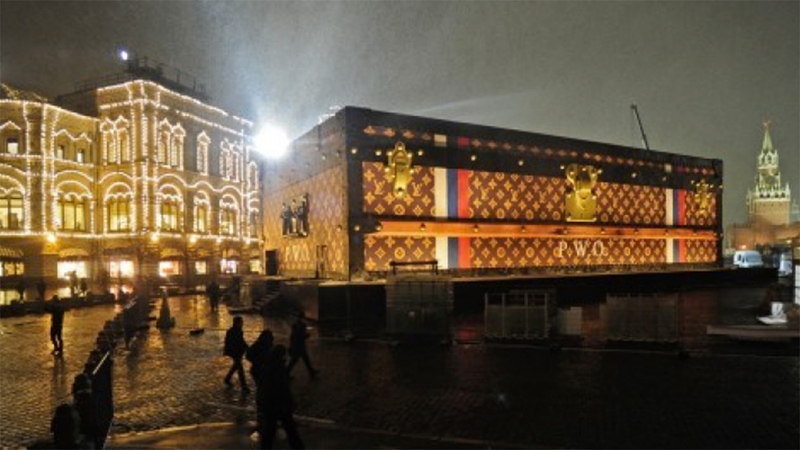 Louis Vuitton is looking to embrace Russia’s future and to stamp its monogrammed mark on the modern Russia and it is doing this by playing on its links to the past. It aims to link the brand with Russia’s opulent past and tie it to the romance and decadence of times when Russia’s wealthy Tsars were the envy of the world. It is looking to engage Russia’s new wealth and its new upper class to remind them both of the past and of the future to reinforce how much has changed and how far the country has come. It’s a bold marketing ploy though because it alienates so many and in such an insensitive and affronting manner. It celebrates the excessive wealth of those who have and highlights the difference for those who have not. Russia, according to analysts, has “the world’s highest level of wealth inequality” its 110 billionaires between them control some 35% of the nations wealth – the highest of any nation. This is clearly the drawcard for so many brands that are rushing to embrace this lucrative market, however it is hard to know just how well the brand really understood what it was doing when it set up its exhibition in Red Square. Fashion has often made very bold statements, and has happily courted and embraced controversy and Louis Vuitton is no exception. However the sheer level of insensivity of this exhibition is quite staggering, so too is the thought that someone somewhere signed this off. So was this deliberate or a major, major oversight? It’s mind bowing to think they did not know what they were doing and if they indeed did know, it’s quite scary to think they simply may not have cared. For Louis Vuitton the attention is a major bonus. The exhibition would barely have regsitered a blip outside of Russia if not for the controversy which has granted it worldwide exposure. The exhibition itself fits extremely well within the content of the marketing campaign and continues to bring to life this magical, mysterious adventure of travel. It’s not a huge jump to assume the next film in Louis Vuitton’s ‘L’Invitation au Voyage’ series will see the spotlight firmly on Russia. The latest LV film – which also stars David Bowie playing a harpsichord – is a feast of magic and decadence of the old world. It pays tribute to the theatres and playhouses of Venice, the mystery of masquerade and the costumes and drama. We see the aristrocracy, the wealthy, the opulence, excess and the somewhat macabre nature of this lavish masked ball. While it aims to elicit the theatre and drama of Venice, it is impossible not to imagine the next film will pay homage to Russia’s decadent past embracing the beauty of Russia’s iconic imagery. But will it be a further slap in the face to Russia or will the brand succeed in winning over the wealthy upper class it seeks to court? If we are to judge it by the entertainment it is providing Louis Vuitton’s ‘The Soul Of Travel’ is a hit, the challenge for the brand is to ensure it does not get tainted by the negative connotations of this brand activity.